Parties in the Great Barn or Haywain Barn, Hellens House and gardens provide a magical environment for you to receive your guests, take memorable photos, and create an unforgettable occasion. The Great Barn seats up to 100 people in comfort around tables. There is a dance floor and we love to have live bands and DJ’s. We have a choice of locations either within the House or Great Barn for parties for between 2 and 150 guests. We have a list of recommend caterers and can provide lists of musicians, photographers, florists and local accommodation. Please contact the Administrator Ruth by email info@hellensmanor.com for more information or call 01531 660504. 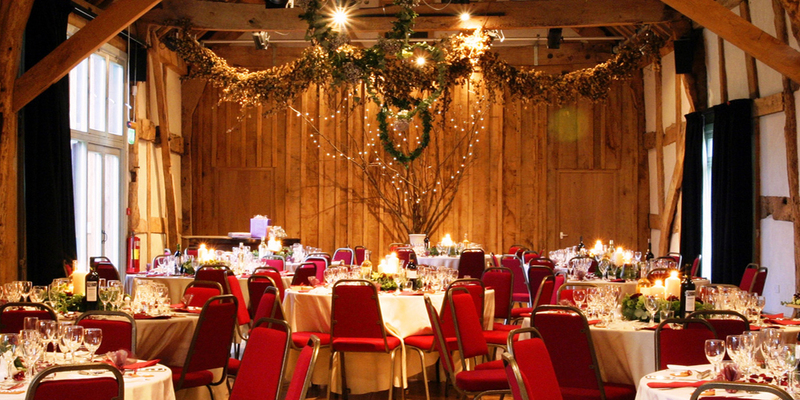 Whatever the occasion for your celebration, the Great Barn and the Haywain are available for hire. The event can be Black Tie or Country Casual. Enough space to comfortably seat 100 to eat and a great catering kitchen. When being refurbished the Great Barn was designed with concerts in mind. We have staging and lighting and have hosted everything from the Peatbog Faeries to Christian Blackshaw. A great location for a gig or classical concert. Steinway Concert D available for professional use (subject to tuning charge). 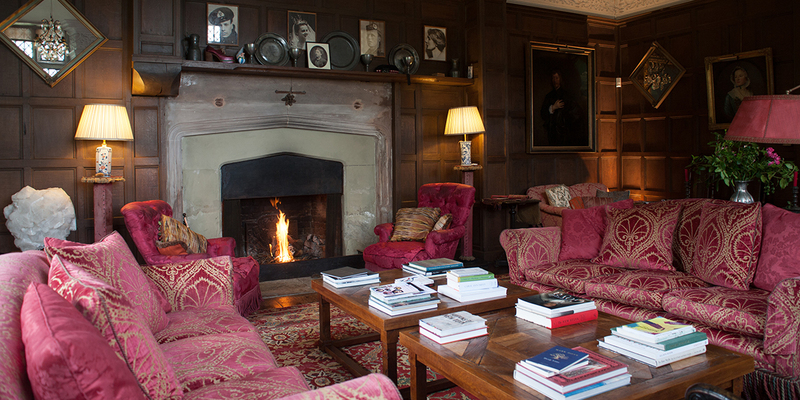 A hugely evocative environment with numerous incredible locations within the location! Come and have a look and a chat. Fashion, cars, archery, we have had many photoshoots with various themes here. Happy to have you. 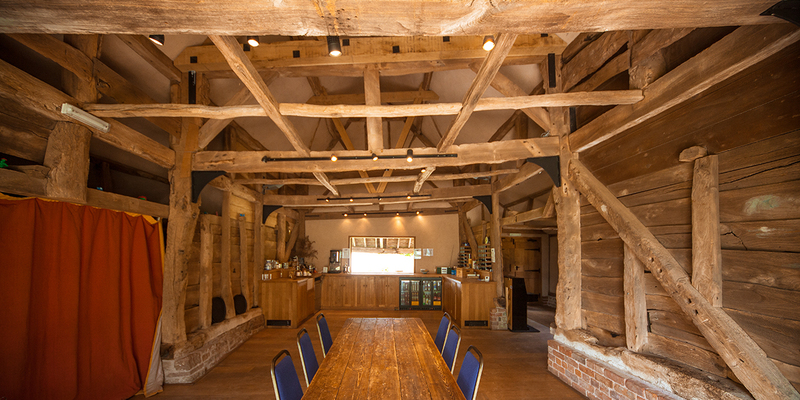 Both the Great Barn and the Haywain Barn are available for hire for meetings. We can cater for refreshments. The Great Barn can accommodate up to 100 (or more) people, ideal for conferences, workshops or simply a corporate away day. Our Haywain Barn is smaller and more intimate but with the same facilities accommodating up to about 25 guests. Catering can be provided and projecting facilities are in place. Maybe incorporate a tour of the House during your visit? Use the gardens for treasure hunts or flying falcons! Hold a survival course in Hallwood? If you have a special occasion to celebrate we can organise a mediaeval banquet in the Stone Hall (even in costume…) or a Pig Roast in the Great Barn. Maybe a candlelit tour of the House followed by supper? Guest numbers can be from 20 to 150. We are happy to organise entertainment from a court jester to a string quartet or local band. We work with local caterers and can plan your event with you. Just bring your imagination! The Georgian Stables is a newly refurbished building specifically for catering for residential, self-catering retreats and courses. It sleeps sixteen people. There are three double rooms with en-suite facilities, seven single rooms with shared showers rooms and one triple room also with shared facilities. 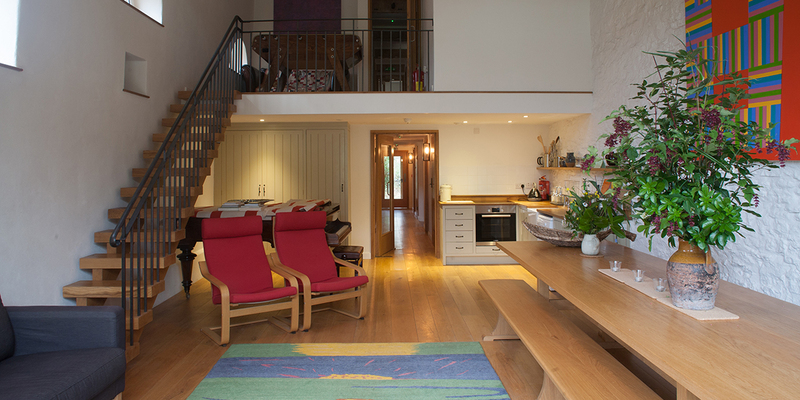 We have a very large kitchen and common room and either (or both) of our barns can be hired in conjunction with the Georgian Stables. The Great Barn is available for hire for wedding receptions, parties, business seminars, concerts, school visits, and other functions. The great Barn seats up to 100 people at our tables for parties, dinners, and receptions. We can accommodate up to 150 on long trestle tables. We can supply round tables, chairs, linen and glassware. Trestle tables and associated cloths can be hired in at additional charge. We are licensed premises and can run a bar for your event. Costs vary according to the type and length of your event. The Great Barn is available for hire alongside the Haywain Barn below if you wish to have a pay bar for your event. 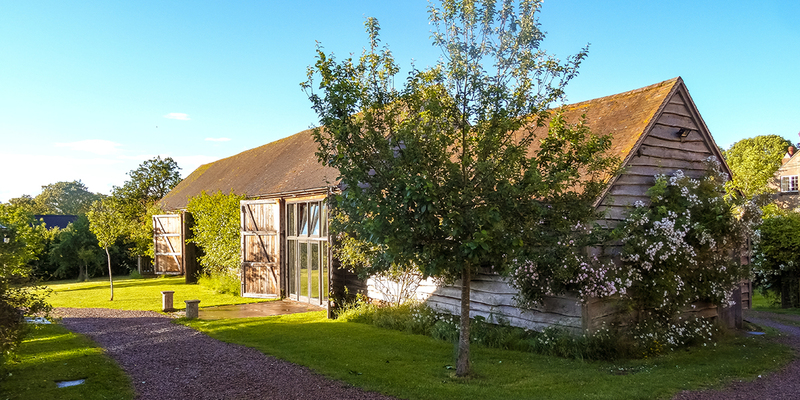 The Haywain Barn, with self-contained kitchen, is available for hire meetings, smaller or children’s parties, business seminars, school visits, and other functions. The grounds are also available to hire for picnics and gatherings.